First off, my deepest apologies for absolutely no posts in months. The truth is, I’m usually apt to post when I’ve got projects going on in my own home, but lately there haven’t been many. We’re casually thinking of moving and in the process have looked at a few houses on the market. Seeing all these gorgeous homes have got me mentally decorating like a mad woman. Today I put together a mood board for what I’m hoping will be my next living room (whenever that happens). 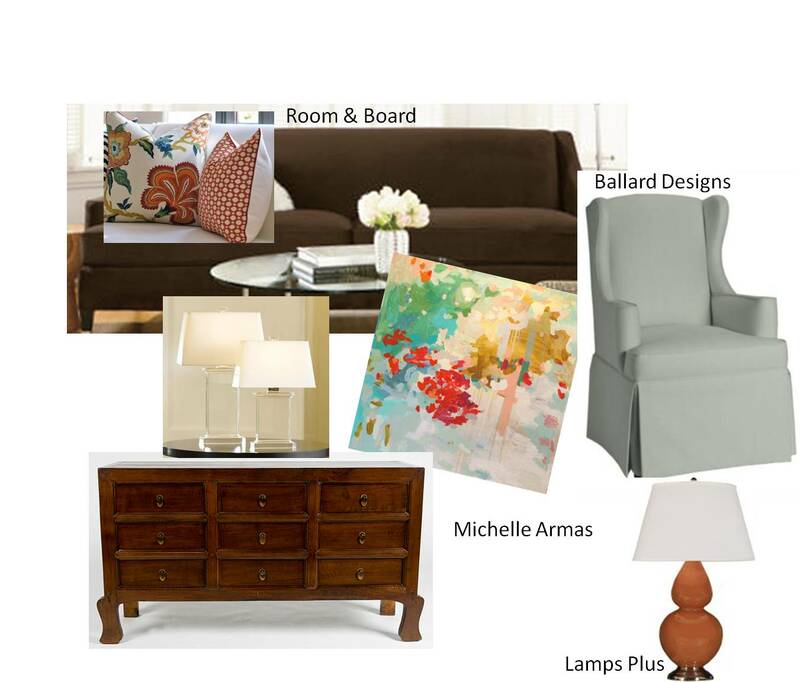 I’ve included some sources if you’re interested…..
It’s a mixture of what I have in my current living room (the pillows, a brown sofa, pops of burnt orange and light blue) with some additional elements like the chair and Michelle Armas painting (she does commission pieces…check her out!). I like that it has some modern elements to it, but is still pretty traditional. Our living room walls right now are a light smoky blue and I love the color but it makes decorating hard when your walls aren’t neutral. I think using main pieces of furniture like wing back chairs is a great incorporate way to incorporate fun colors into an otherwise neutral room. Hope you like it!